Alaska Native and American Indian people have high rates of serious, life‐limiting illness, but rarely use palliative care services such as advance care planning due to a lack of interventions that support patient‐provider communication on this important topic. This subaward provides funding for WSU to help the Southcentral Foundation develop and evaluate the first culturally appropriate, patient‐centered intervention to promote advance care planning communication with Alaska Native/American Indian people in primary care settings. It will provide important scientific and clinical evidence to improve patient and caregiver outcomes among 5 million Alaska Native/American Indian people. A substantial number of critically ill patients experience persistent organ failure leading to chronic critical illness. The majority of these patients die within a year. Many survivors must cope with severe, long‐term physical and cognitive limitations, which present a significant clinical, emotional, and economic burden. Little is known about which patients are at highest risk for physical and cognitive dysfunction. Also, there is currently no validated method to predict long‐term functional disability for purposes of shared decision making and resource planning. As part of this project, WSU will assist the University of North Carolina in conducting the first multicenter prospective cohort study that measures risk factors for long‐term physical and cognitive dysfunction in chronic critical illness. The subcontract provides funding for Chaytor to oversee cognitive and functional outcomes from the study. The project will provide new tools for patients and clinicians to understand chronic critical illness, informing bedside decision making and future medical and resource interventions for this extremely high‐risk patient group. There have been calls to include neurocognitive assessment in clinical trials. However, use of traditional in‐person neurocognitive assessments present logistical challenges and reduces the inclusion of participants living in remote areas or with transportation limitations. To overcome these barriers, this study will test the validity and evaluate the acceptability of a self-administered online neurocognitive assessment battery (www.testmybrain.org) compared to traditional in‐person neuropsychological tests. The study will be conducted in a group of Providence Health Care patients with diabetes and diabetic kidney disease, who have high rates of neurocognitive impairment associated with both disease outcomes and treatment adherence. Depending on the study outcome, this project could make routine assessment of neurocognitive outcomes in clinical trials possible, which could lead to new insights into neurocognitive effects and/or intervention mechanisms that would have otherwise gone undetected. The project will help improve the scientific understanding of the interaction between liver disease and exposure to toxic substances in the environment. Specifically, it will seek to understand how the liver disease nonalcoholic steatohepatitis (NASH) alters the toxicokinetics and toxicity of the waterborne toxin microcystin‐LR (MCLR). NASH—the most severe form of nonalcoholic fatty liver disease—is estimated to be present in 5 to 17 percent of U.S. adults. In addition to the liver problems these patients face, they also have higher rates of chronic kidney disease, which may be associated with exposure to MCLR. MCLR‐producing cyanobacteria are commonly found in sources of drinking water around the world. Preliminary studies conducted by Clarke showed that MCLR exposure in NASH dramatically increases kidney toxicity compared to healthy controls exposed to MCLR. This new study tests the hypothesis, based on the earlier work, that people with NASH are at increased risk of altered MCLR exposure and MCLR‐induced kidney toxicity due to changes in liver uptake transporters known as organic anion transporting polypeptides (OATP). This contract provides funding for Daratha to help procure, manage, and manipulate data associated with a research project led by investigators at the Providence Medical Research Center. The project involves a partnership between Providence Health and Services and the University of California Los Angeles health systems to establish collaborative registries to advance awareness, detection, intervention, and research in chronic kidney disease (CKD). The registries cover Providence and UCLA patients with electronic health records who have been diagnosed with CKD or are considered at risk for CKD and had at least one encounter since 2006. Data collected includes demographics, encounter type, socio‐economic characteristics, laboratory values, imaging studies, and medication data. The registries will be linked with national death indices and the United States Renal Data System to verify mortality and kidney replacement therapy outcomes. This award funds a project to assist the Oregon Department of Public Safety Standards and Training in enhancing its basic police training program. Based on prior research, James will identify decision points and behaviors in dynamic social encounters that are most likely to lead officers to making legal and legitimate decisions and to result in good outcomes. He will use a set of behavior‐based metrics previously developed at WSU as standards for testing and evaluating officer performance. This professional development award funds Kathryn Kane’s attendance at a three‐day intensive course that teaches medical librarians evidence‐based clinical practice concepts. The goal of the course is for librarians to improve their ability to support and teach evidence‐based practice at their institutions. The award is funded by the National Network of Libraries of Medicine, Pacific Northwest Region. The protein Activating Transcription Factor 5 (ATF5) controls how often specific genes are copied from DNA and regulates genes that control cell survival. ATF5 is required for the survival of breast cancer cells, but is not necessary for the survival of health breast cells. There is currently no explanation for this difference in function. The researcher will look to identify the molecular mechanism that underlies the survival function of ATF5 in breast cancer cells. This may ultimately lead to the development of new strategies to selectively kill breast cancer cells without damaging surrounding healthy breast tissue. This award provides funding for McPherson to provide statistical expertise and data analysis for a project funded by the Veterans Affairs Health Services Research and Development Service. The project seeks to examine and compare changes in pain intensity and pain treatment utilization following the discontinuation of long‐term opioid therapy among veterans with and without substance use disorder diagnoses. This subaward funds work to establish a Pacific Northwest satellite center of the Center for American Indian and Alaska Native Diabetes Translation Research, which is based at the University of Colorado Denver. The goal of the main center is to improve the diabetes‐related health of American Indian and Alaska Native people by extending prevention and management research of proven efficacy to both clinical and community settings in American Indian/Alaska Native communities. The Pacific Northwest satellite center will engage local tribes in activities aimed at increasing awareness related to diabetes translational research among American Indians and Alaska Natives; organize and sponsor annual regional conferences about diabetes translational research among American Indian and Alaska Native populations; and develop a regional plan for disseminating the work and research findings of the center. mechanism by which this happens and look for substances/natural products that can inhibit this process and prevent the progression of rheumatoid arthritis. This is renewal funding for a field study of sleep and performance in pilots on ultra long‐range flight routes in commercial aviation. Flight routes studied include those between the U.S. west coast and Sydney and Melbourne, Australia; the U.S. west coast and Singapore; and the Island Hopper route between Honolulu and Guam. This work supports the airline’s use of fatigue risk management, a nonprescriptive approach to managing flight and duty times. This is continued funding for a five‐year grant to establish—in partnership with the University of Colorado Denver—a new collaborative research center aimed at reducing health risks related to high blood pressure in U.S. Native populations. The center will draw in expertise and solicit input from community organizations, tribes, and researchers across the country to pursue intervention studies that will use technologies, including electronic medical records, text messaging, wearable physical activity monitors, and home blood pressure monitors. This is a subcontract for supplemental funding awarded to the University of Colorado Denver by the National Institute on Aging for the Native Elder Research Center. The Native Elder Research Center is a collaborative effort between UC Denver and WSU to close care gaps in Native elders, who are at greater risk of numerous acute and chronic illnesses, and increase their participation in related research. This supplemental funding supports the initial stages of research or training related to Alzheimer’s disease and related dementias. It will allow the principal investigator to bring together Alzheimer’s and dementia experts, Native scholars, neuropsychologists, and others to identify new opportunities to engage in Alzheimer’s disease‐related research, especially for junior American Indian and Alaska Native faculty investigators. This grant provides renewal funding for the researcher to provide statistical services to support the Empire Health Foundation’s obesity prevention initiative. Daratha will import student data from each of seven intervention school districts and Educational Service District 101 into a common database for analysis. Student data captured includes demographics, physical measurements, meal participation, fitness performance, attendance, and academic performance. This is a funding increase for a project to determine the cellular mechanisms that underlie sleep homeostasis, the process that regulates the pressure to sleep based on prior wakefulness. Since impaired sleep homeostasis can cause poor sleep, it is important to understand the cellular processes involved in sleep homeostasis. This study will look at glial astrocytes, which are found throughout the brain and may play a central role in sleep homeostasis. Astrocytes drive how the brain tries to compensate for sleep loss. Because the chemical signaling between glial astrocytes is associated with changes in intracellular calcium, this study will use a mouse model to test the hypothesis that intracellular calcium dynamics contribute to the accumulation and discharge of the pressure to sleep. Study results will provide new insights into how glial astrocytes affect sleep homeostasis and will bring scientists one step closer to understanding the underlying causes of abnormal sleep. This is supplemental funding for a project in which WSU is partnering with Better Health Together and the Alliance for Integrated Medication Management to develop, implement, and evaluate a prototype medication delivery system to serve patients with chronic disease in seven counties in eastern Washington. The partner organizations are working with primary care providers, pharmacies, and community partners in the counties to develop the system, which will offer integrated medication management and medication optimization and has the potential to improve patient outcomes, increase access to care, and decrease costs. This grant provides renewal funding to continue the Summer Undergraduate Research Fellowship (SURF) offered by the WSU College of Pharmacy. The program provides undergraduate students with hands‐on experience in pharmaceutical or biomedical research as a way to promote graduate education and research careers in the field. This is continued funding for a study of the effectiveness of the Caring Contacts approach as a way of reducing suicidal ideation, suicide attempts, and suicide‐related hospitalizations among Native American young adults. A recent study has found that suicide rates for Native American young adults in the Northern Plains and Alaska are much higher than those for white Americans in the same regions. The Caring Contacts approach uses text messages expressing care, concern, and interest to supplement standard suicide prevention. In a randomized, controlled trial, this study will compare the use of the Caring Contacts approach as a supplement to usual suicide prevention care versus usual care only in at‐risk Native American young adults. This is continued funding for WSU’s role in the founding of a multidisciplinary Center of Excellence on Natural Product‐Drug Interactions Research, in collaboration with the University of Washington and University of North Carolina at Greensboro. The goal of the new center is to create a roadmap for best research practices on how to study potential unwanted interactions between natural products and conventional medications. The team will work with the National Center for Complementary and Integrative Health (NCCIH) officials to identify a priority list of natural products that could affect the efficacy and safety of conventional medications by altering drug distribution and elimination in the body; identify hurdles to studying these interactions; propose approaches to overcoming these challenges; develop a Web portal that will allow other researchers access to data for further analysis; and communicate health implications of findings to the public. This is the renewal of a subaward for a project aimed at advancing scientists’ understanding of Rett syndrome, a debilitating neurodevelopmental disorder that causes problems in brain functions that are responsible for cognitive, sensory, emotional, motor, and autonomic function. Although the genetic cause of the disease has been identified as mutations in a gene called MECP2, the mechanism of the disease is not well understood. This study will explore the potential role of sterol metabolism in Rett syndrome. Sterols (or steroid alcohols) occur naturally in plants, animals, and fungi. The most familiar type of sterol is cholesterol. Clinical trials of gene therapy for AIDS have revealed that a significant roadblock is inefficient delivery of the therapeutic DNA to the patient’s chromosomes. 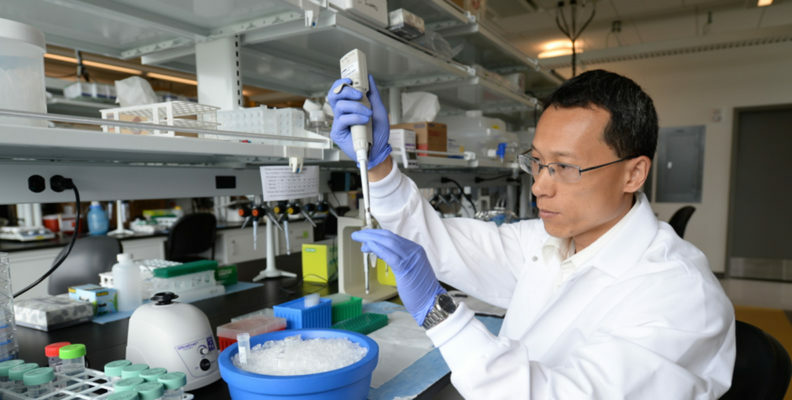 This grant provides continued funding for a research study on the potential for using viral vectors from the foamy virus—which is related to the HIV virus—as a transfer agent for AIDS gene therapy.